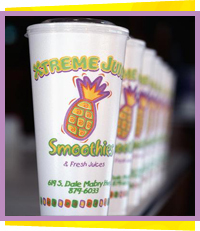 Xtreme Juice Smoothies Tampa serves the Tampa Bay area's freshest, highest quality smoothies, fresh juices and wheatgrass shots. Xtreme Juice also serves smoothie pops and protein shakes. Check out our menu for a list of all our quality products. Having a special event or party that needs catering in the Tampa area? Xtreme Juice Catering offers a unique Tampa catering experience. Visit our Catering page for details. Xtreme Juice has partnered with UberEATS so you now can get our delicious South Tampa smoothies delivered right to your front door, office or anywhere within the Tampa Bay area. The delivery menu differs slightly from our regular menu so please be sure to Login or Signup to check out custom UberEATS menus here. To order, simply visit UberEATS.com. Don't forget... Buy 1 Get 1 Sundays! Every Sunday is SMOOTHIE SUNDAY! 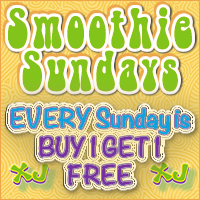 Buy one smoothie and get one free all day long! Only at South Tampa's favorite smoothie shop - Xtreme Juice! 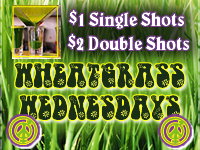 EVERY Wednesday from now on is Wheatgrass Wednesday with $1 single shots / $2 double shots at Xtreme Juice!